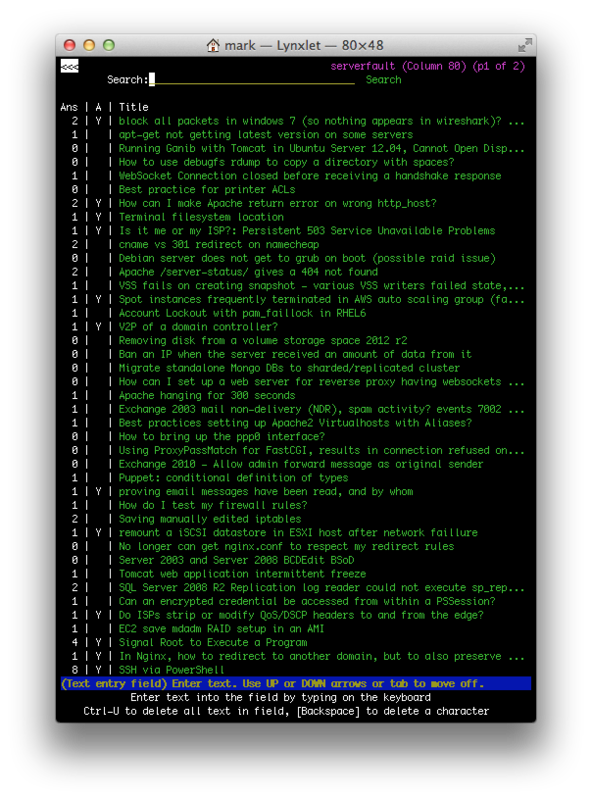 Browsing the existing Stack Exchange family of websites was OK in a text-based browser, but when you're stuck in a Linux shell with no way out and no other computers around and you just know you saw the answer on Server Fault last week, this is how you can find it easily. It assumes you already have existing knowledge of the SE family of sites in order to navigate. Public Domain. Feel free to do with it what you will. Grab it here (note: This is the old v1 API. I have not packaged v2 yet). http://www.column80.com/ (note: looks like rubbish in modern browsers, Firefox, Chrome, Internet Explorer, etc. It has got to be viewed in Lynx to get the full effect). Optimised for Lynx. This sounded pretty niche when I made it, but it looks like it might already have been some use to some users! I haven't done any programming in about five years, so it was also a way for me refresh my skills. It uses the PHPStack by Thomas McDonald. If you really want the source and you promise not to make (public) fun of me, then I'd be more than happy to share. I've cleaned up the code a bit, and incorporated some suggestions from the public, so I feel comfortable releasing the code. Grab it here. (9th May 2014) updated the site to use the v2 of the API. Removed some never-used features such as tag search and user profiles, as I'm pretty short on time. One of the questions contained <button> in the title, causing the entire rest of the page to be rendered in a button. You might want to run the title through htmlentities() first. This is nice, but it gives the "You're not using Lynx" warning for other text-based browsers. It looks and works great in w3m as well, so it should probably skip the warning in that browser as well. Just pointing out: this system actually violates the content license because it does not link back to the original posts or authors in any way on the questions. Fatal error:  Uncaught Error 400: An API error has occurred. It would be nice to have the search button BEFORE the title and tag options. Also I get bugged about cookies, do you really need cookies?